More and more sports and entertainment brands are using live data to create second screen, app-like experiences in email. 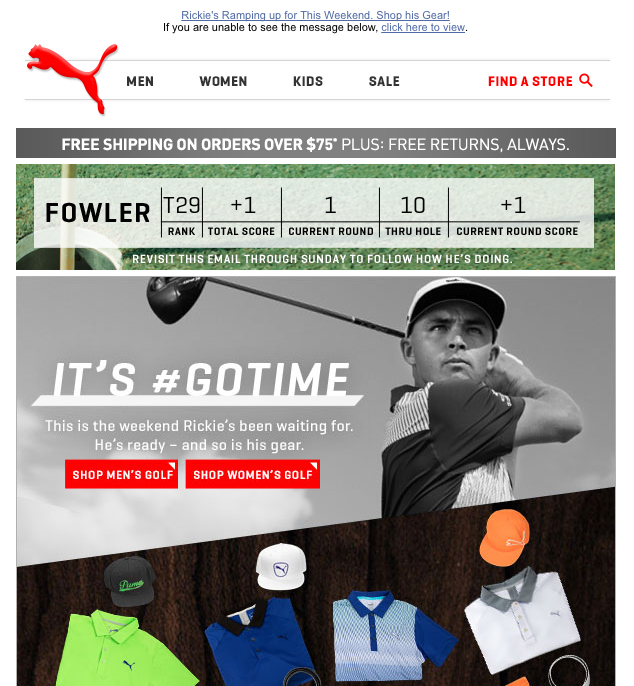 A recent PUMA email is a great example of this move toward dynamic email. Rickie Fowler is a star on the professional golf circuit—currently ranked number five in the world. He’s also an “ambassador” for PUMA, one of the world’s leading designers and manufacturers of athletic and casual footwear and clothing. When Fowler teed off at the start of this year’s Master’s tournament in April, his fans around the world were no doubt eager to keep track of his progress in real time. They were able to do exactly that thanks to an email from PUMA featuring dynamic content. PUMA timed the email for delivery at the start of the tournament. It featured a live scorecard enabled by integration of the API feed from the PGA that tracked Fowler’s tournament position and score. All a fan had to do to check on his progress was reopen the email. The email also highlighted the PUMA clothing that Fowler planned to wear each day of the tournament. Although Fowler did not make the cut and play into the weekend, the increased engagement generated by the email was enough to convince PUMA of the value of the approach, and the company plans to implement the live scoring feature in future messages. The success of the PUMA message comes on the heels of a similar initiative by the Detroit Pistons, who are employing a dynamic, contextual email platform to share live scoring and other information with their fans. This entry was posted in Email Spotlight on May 12, 2016 by Amy Mullen. ← Are Millennials Within Your Email Reach? Definitely.